PS: You can follow them on Facebook and Twitter. 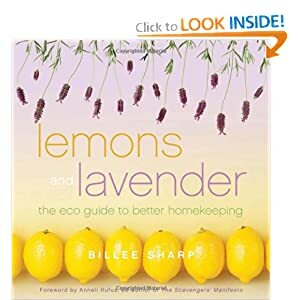 I just finished reading Lemons and Lavender, the eco guide to better home-keeping by Billee Sharp. I was very interested in reading this book, as I strive to be as kind to the environment as possible, and I prefer to avoid the use of chemicals whenever I can. I was surprised by the number of useful tips that author Billee Sharp offers in this useful book! I loved that the tips were not limited to cleaning; I additionally found many useful recipes and home remedies within the pages of Lemons and Lavender. This book would be ideal for someone who is interested in learning more about living a greener life, but needs a little help to steer them in the right direction. As more people begin to understand the dangers to overall health and the environment that are associated with many popular cleaning products, eco-friendly home keeping is gaining popularity. Lemons and Lavender is a good choice to use as a guide for beginning your environmentally friendly home keeping project! With the summer wedding season quickly approaching, Lemons and Lavender would make a nice addition to any gift that you might give to a newly married couple. Not only will they enjoy the money saving, environmentally friendly tips this book offers, but also the recipes and words of wisdom from the author. I would recommend this book to anyone who is new to a green lifestyle, is looking to create less waste and reduce the negative impact that their life has on the environment. Overall the book was an entertaining and interesting. I believe I will reference the tips and recipes included in Lemons and Lavender many times over the years!